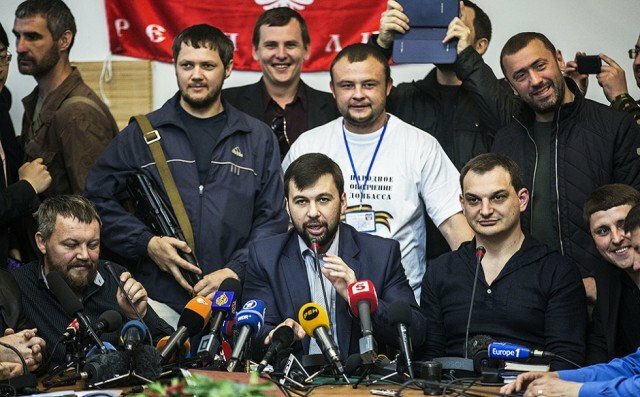 Ukrainian separatist leader Denis Pushilin is calling on Russia to “absorb” the eastern region of Donetsk after Sunday’s unofficial vote on its status. The leader of the self-declared Donetsk People’s Republic said Moscow should listen to the “will of the people”. Russia has called for dialogue and “implementing” the result, but Ukraine and the EU declared the poll illegal. The EU is imposing further sanctions over Russia’s actions in Ukraine. Separatists in Donetsk and Luhansk regions say 89% and 96% respectively voted in favor of “self-rule”. Earlier the head of the rebel Donetsk election commission, Roman Lyagin, said joining Russia “would probably be an appropriate step”. Russia has called for dialogue between the militants and Kiev with the participation of the Organization for Security and Co-operation in Europe (OSCE).